Dentistry has come a long way since the olden times, when people in many cultures believed that cavities were holes bored by tooth worms. This is the age of digital dentistry. Usage of x-rays, dental drills and manual removal of decayed tooth is going to be history soon. The field of dentistry is constantly evolving, changing, and advancing and is becoming more efficient and natural-looking for the patient’s as possible. Let us take you through some cool developments in dentistry, which surely would be of use to you….. This is the age of Artificial Intelligence and why should ‘Brushing’ be left behind. Products are already available in the market that are designed to help users improve their oral health, by providing feedback about brushing techniques collected by integrated artificial intelligence (AI). This would be a great hit with parents as they would be able to track their kids brushing habits. The moment you hear about braces, a sense of discomfort sets in. But not anymore. Clear aligners, also known as clear-aligner treatment, are orthodontic devices that uses incremental transparent aligners to adjust teeth as an alternative to dental braces. These aligners straightens teeth using a series of nearly invisible, removable aligners that are custom-made specifically for patient’s teeth. Each aligner is worn for 20-22 hours a day for two week. Teeth will move – little by little, week by week, gradually moving towards the projected final position. Zoom whitening is a teeth-bleaching procedure performed in a dentist’s office. This is a cosmetic dentistry procedure that lightens teeth and helps to remove stains and discoloration. After a hydrogen peroxide gel is applied to the teeth, an overhead lamp delivers UV light to the area, breaking down the activated gel. This allows oxygen to enter the enamel and dentin, bleaching the colored substances while leaving the structure of the teeth intact. Treatments typically last about an hour and may result in up to eight shades of improvement. Teeth whitening treatment is not suitable for every patient and is subject to the patient’s oral health. HealOzone is a fast, easy and painless way to eliminate tooth decay. Healozone is a device that delivers Ozone in a controlled manner for use in Dental procedures. HealOzone is effective because it contains ozone (O3), which is a common, natural gas that effectively kills bacteria and fungus. In twenty seconds, 99.9% of the caries (decay) producing bacteria are eliminated. The ozone is pumped away, broken down into oxygen again-and the tooth is caries-free without pain. Curozone Inc., Canada, developed the HealOzone. Tooth piercing is catching up fast with young people. Etched with a small jewelry the tooth gets a sparkly look. Being a painless procedure, it has lesser risk of infection. Attractive gems, and twinkles available in different shapes such as the heart, diamond, triangle, drop are used. Patients often avoid oral care due to the fear of pain that they have to undergo during drilling to remove caries. Hard tissue laser could be the answer to this problem. A hard tissue laser allows the practitioner to remove carious tooth structure while preserving healthy enamel and dentin for truly minimal invasive dentistry. Lasers have become a standard feature in the dental practice, enhancing treatment in both hard and soft tissue applications. Imagine teeth that remain white and perfect over time, without any accumulation of bacteria that cause dental problems. Wow no dental visits too. 3D printing within the field of dentistry is showing positive signs. 3D printers combine high-quality 3D printing technology with good quality library of dental materials. There are two basic approaches to 3D printing: printers that deposit layer after layer of materials to build an object from the ground up, and CNC milling machines which takes a block of material and carve out the desired object. This technology is already used to make dental crown. Instead of making a mould out of the troubled piece of chew-ware, the tooth is 3D scanned with a specialized software and sent to an on-site system for immediate manufacturing, which takes about an hour and produces an exact porcelain crown, which after a short waiting period is ready to be applied to the patient’s mouth. No longer patients have to wait week long for the traditional moulding solution. Nanorobots would be put to use to detect oral cancer, deliver anesthesia, destroy caries-causing bacteria, painless tooth uprighting, rotating, vertical repositioning and even repair blemishes on the teeth where decay has set in. 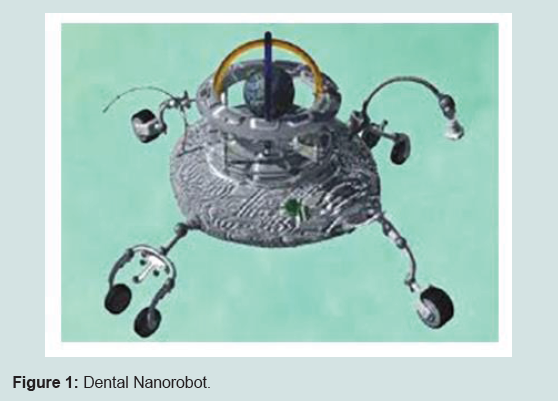 Dental nanorobots will possibly use specific motility mechanisms to penetrate human tissue with navigational precision, acquire energy, and sense and manipulate their surroundings in real time. An onboard nanocomputer that executes preprogrammed instructions in response to local sensor stimuli could be utilized to control the nanorobot functions. Also, the dentist could issue strategic orders directly to the nanorobots in vivo via acoustic signals. We have to wait couple of more years more to see them in action. Wow, so much tech in there! Can’t believe there is a smart tooth brush nowadays wow! Wow its a fabulous post. You have given knowledge about so many new tech products which I was not aware of. All these products are amazingly superb for dental care. Thanks for sharing. All the dental products you shared here. I never heard of them. Thanks for sharing this is a great informative post. Wow oral health care has been advancement so much. Actually we take oral health for granted until start facing discomfort. Thanks for such an educational post. Whoa, so much information. That smart brush sounds cool and interesting. I so wish to buy this electronic brush for my daughter. And I am amazed to see how oral health has revolutionised technologically.